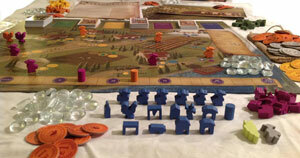 Viticulture, designed by Jamey Stegmaier and Alan Stone of Stonemaier Games, is all about the planting, harvesting and crushing of grapes to make wine. Four types of wine, in fact: red, white, blush and sparkling wine. To accomplish this, players utilize their limited work force (yes, it’s a worker placement game) over the course of a year broken down into seasons. In the spring, players vie for play order, acquiring a card, victory point, coin, extra worker, or nothing if they really want to go first. In the summer, they can acquire grape seeds (green cards), plant grapes, give a vineyard tour to earn money, build structures (which cost money) or play visitor cards (which can accomplish any of the aforementioned or provide some other benefit). In the fall, players each take a summer (yellow) or winter (blue) visitor card. Any player who’s built his cottage can take a second card. Then in the winter, players can train a new worker, harvest grapes, crush grapes into wine, fill orders or play winter visitor cards (some of which also provide those actions or others). At year end, grapes on your crush pad and wines in your cellar age, increase in value, players receive residual income and discard down to seven cards if necessary. The next year (round) begins with players again vying for play order with their spring chickens. Oh, did I forget to mention the chicken meeples? One of the coolest things about Viticulture is its lovely bits: a set of 17 unique wooden playing pieces for each player. Six farmer meeples represent your workers, a cork tracks your victory point score, your chicken placement determines play order for the year (round), wine bottles keep track of your residual income, and eight different buildings keep note of which structures you’ve built in your vineyard (play mat): trellis, irrigation, medium wine cellar, large wine cellar, yoke, cottage, windmill and tasting room. Several things set Viticulture apart from other worker placement games. One is that your workers have to last two rounds, through spring and winter, instead of just a single round like in Stone Age or Agricola. Viticulture also supports more players than most other worker placement games: six instead of the usual four or five. Play is to a set number of 20 points at year-end. We found most games to last about seven rounds. I think Viticulture plays best with an odd number of players, three or five. There seems to be a better balance of available actions and less frustration of getting locked out of something you really need to do. With six players, there doesn’t seem to be enough visitor cards. Viticulture is very replayable. I tried different strategies in each game I played so I can attest that there are indeed multiple paths to victory. The Aboriculture expansion, originally a Kickstarter exclusive for Viticulture‘s first edition, provides a Grande Worker, additional action spaces, and ways to increase victory points earned for filled orders. The Grande Worker was such a hit, that the designers included it in the second edition of the Viticulture base game. The rest of the Aboriculture expansion is now available in Tuscany: Expand the World of Viticulture. Tuscany is really more of a conglomeration of 12 expansions for Viticulture all packaged together in one Viticulture-sized box. The original idea for Tuscany was a set of four expansions that could be used independently or together, one of which would be Aboriculture. Some of the new expansions were planned to come from a Viticulture expansion design contest. That combined with a highly successful Kickstarter campaign resulted in the mammoth Tuscany, which is available in stores now. I’ll be covering it here soon. Everything about Viticulture screams quality, from the clearly-written and well-formatted rulebook, to the smooth play – proof of how much it was play-tested – to the lovely board, sturdy box and unique wooden bits. Viticulture supports 2 to 6 players ages 13 and up and has a playing time of 45 to 90 minutes. There’s a copy in our Here Be Books & Games’ Demo Game Library so we can teach you how to play! 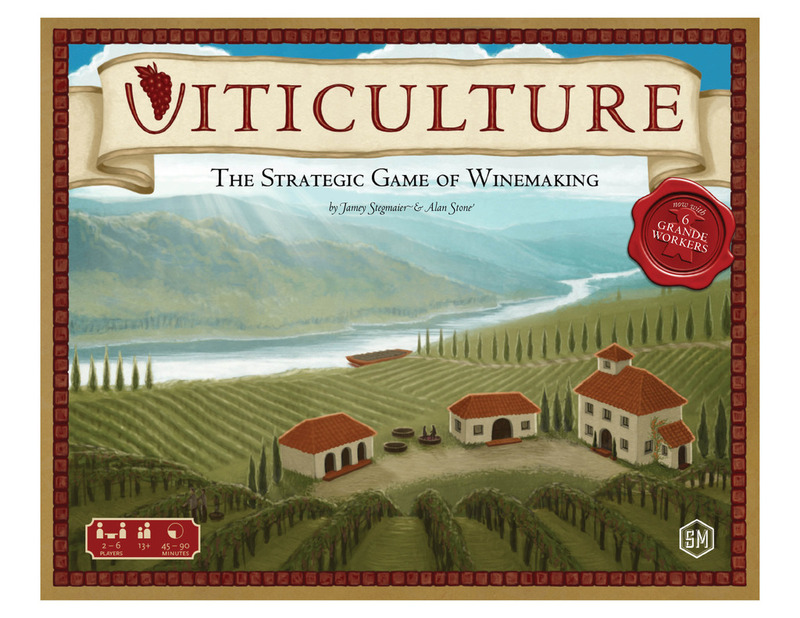 Stonemaier Games published a second edition of Viticulture shortly before Tuscany‘s release. There are a few new components – like the aforementioned Grande Workers – and rule changes in Viticulture Second Edition. Smaller glass tokens – these should fit much better on your player board. 11 Visitor cards (you should remove the originals and replace them with these) with text updated to reflect the new rules. Each player begins the game with 2 regular workers and 1 grande worker. The grande worker can be placed like a regular worker, however, he can also be placed on a full action space, thus guaranteeing you access to at least one action you really really want each year. The Crush Grapes action has been modified – this is probably the action new players are most confused by. Now it’s called Make 2 Wine Tokens – the bonus action space allows you to make 3 wine tokens. In the original version, Crush Grapes, you could make as much of you wanted of one type of wine. The new Make 2 Wine Tokens is much more flexible – and hopefully easier to understand – because you can make any two wines: one red and one white or one white and one blush – it’s up to you. The Yoke has been modified as well. Now, if you have one built, you can use your Yoke to harvest or uproot in either summer or winter – or any season if you’re using the extended board in Tuscany. I’m very happy to see this change. The first several times we played Viticulture, we mistakenly played it that way. Then one day while rereading the rules, I discovered that you could only uproot in summer and harvest in winter. I was very sad because I really liked to harvest in summer. I guess I was just ahead of the times. Yokes are cool again. In the first edition of Viticulture there’s a rule that says, you cannot place your worker on a bonus action space unless you plan to make use of that bonus – say play 2 cards – or it’s the only space available for that action. This prevents players from taking the bonus space simply to block another player from utilizing it. This rule has been done away with in Viticulture Second Edition. The Tuscany rulebook rightly refers to it as the “No More Friendly Rule”. I have to say I prefer more friendly games, so I expect we’ll be utilizing the original rule in most of our games. Yes, yes, I know: I’m a rulebreaker! You might also be interested in Tuscany: Expands the Game of Viticulture in Myriad Ways.